Below you can read about the most common knee injuries other than meniscal tears, which are covered in a separate section. The inner side and outer side ligaments are also referred to as the medial and lateral collateral ligaments (MCL and LCL). Those two ligaments gives sideways stability - and those can be partially or totally torn by a knee twist. The treatment of the two ligament injuries is different. The mediale collateral ligament normal heals sufficiently by itself in opposition to the lateral collateral ligament. The MCL tear is treated by a site to site stabilising brace, having normal range of movement and full weight support. Normally the MCL ligament is sufficiently healed to remove the brace after 6 weeks. The LCL is typically injured together with the ACL and the recommendation is always repair/reconstruct since the tears seldom heal by themselves. Another ligament that has been given much attention lately is the Antero Laterale Ligament (ALL) and that is an important ligament that protects the knee towards too much rotation in relation to the femur. It can sometimes be needed to reconstruct that ligament simultaneous to the ACL reconstruction​. Cartilage lesions in the knee are common.The cartilage is a very important surface covering the bone. The cartilage is surprisingly most of all made of water and is extremely slippery in order to make the joint go smoothly and the cartilage is an important shock absorber. It is difficult to compare the cartilage with anything we know from daily life, but think about it as the peel from an orange. The cartilage can be torn off by a sudden twist or hit. The cartilage flake can float around in the knee as a loose body and cause sudden locking when it catches. The area where the cartilage is missing is a cavity, and potentially this can cause pain and mostly the knee will becomes swollen. Many cartilage lesions will slowly recover without any treatment, however some lesions continue to cause knee pain. Osteoarthritis in the knee is also a kind of cartilage lesion, however in this situation this is more a kind of cartilage thinning, based on decreased cartilage quality over time causing the cartilage to fragment and wear. So at one end of the spectrum we do have cartilage lesions in the very young with fresh cartilage, and in the other end of the spectrum there is older people, where the cartilage starts to breakdown for more or less unknown reasons. In the middle between those types are all kind of variations. The treatment of the different types are different and this naturally makes this area of treatment very complicated. A lot of science is ongoing but still the big breakthrough is lacking. I am personally working with a study on Lipogems for treatment of osteoarthritis. This is micro-fragmented adipose tissue containing stemcells. Cartilage lesion in younger people (here is meant below 40 years) is typically treated by microfracture (Steadmann). 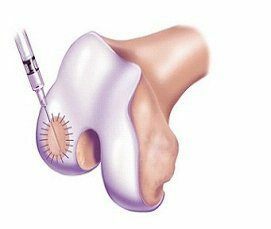 This is a treatment based on arthroscopic cleaning of the lesion and then small holes in the bone is applied to the button of the lesion directly into the bone. This causes some of the bone marrow and blood to float into the defect and fill it. Over time this will mature into some cartilage looking scar tissue. When such a treatment is done, the knee must not be loaded for 8 weeks, since the area has to mature in order to stand the forces. It normally takes one year before the repair tissue is 100 % healed. Unfortunately does about ⅓ not heal and in those cases a lot of advanced methods exist. The most famous is cartilage transplantation (autologous chondrocyte transplantation - ACI). This method was started already in 1987 by Mats Brittberg and is therefore a well known technique that has been refined many times. Most people ask why not start with this instead of microfracture? The short answer is that it is troublesome and very costly and the results are only minimally better. By cartilage transplantation we harvest some cartilage and this is then regrown for some months, and then the cartilage cells are transplanted into the defect by another operation.There has been attention drawn to the issue that some cartilage lesions never heal because of underlying malalignment and axis deviations. Those knees must have they imbalances simultaneous corrected by osteotomies - see for example tibia osteotomy or trochleoplasty or tibial tubercle osteotomy. All knees do have a plica placed on the inner site of the kneecap (parapatellar) and one in the front of the knee (infrapatellar). The inner plica has no know function, but is a residual from the fetal life. Sometimes a knee impact or wrong use of the knee can cause this plica to get inflammed and the it gets swollen and catch between the kneecap and the femoral condyle. The treatment focus rest and antiinflammatory medicine (NSAID or steroids. When the plica has restored it self, a physiotherapis can help by restoring balance and correct movement patterns to prevent recurrence. 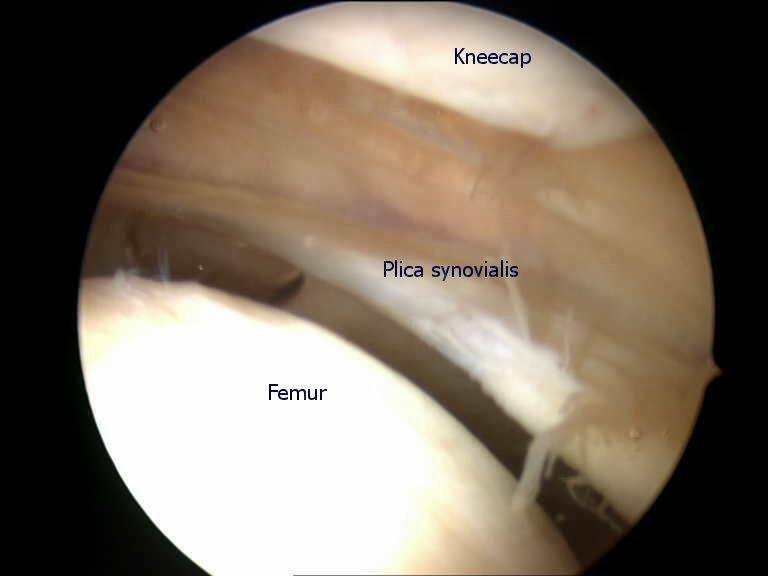 Sometimes those treatments are not sufficient and the medial plica has to be taken care of by arthroscopic surgery, where it easily can be removed. 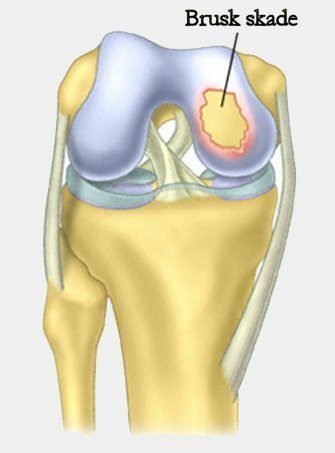 Osteoarthritis in the knee means wear and damage of the cartilage. For more or less known and unknown factor the cartilage becomes thinner and in a bad quality situation. Some people seems not to be very affected until it gets really severe, while others are very troubled already when the wear situation starts. In my opinion this can be explained how the synovial tissue, that contains all the nerve endings, responds when the microscopic cartilage particles are going to be reabsorbed from the knee. For a small proportion of people, the synovial tissue will get swollen and painful already when it gets in contact with a small amount of cartilage particles and for those the symptoms of osteoarthritis will start concomitantly to the wear starts. This can be very frustrating since you cannot see the osteoarthritis in X-rays and MRI in the early phase of osteoarthritis. For most people the symptoms of osteoarthritis will first appear when the wear is more pronounced. The typically symptoms will then be pain after activity and night pain Many known and unknown risk factors for osteoarthritis exist. First of all is previous injuries such as meniscal tears, cruciate ligament tears, cartilage lesions, bowed legs and fractures of importance. Also more intrinsic factors like heritage and nutrition (D-vitamin) are of importance.